Nalvilie Saren is a Dunmer clothier who lives in the St. Olms Canton of Vivec. She has a selection of low-quality clothing for sale. She once had a relationship with Hlaren Ramoran of House Redoran, but has long since called it off, though he may still have feelings for her. If you look hard enough you can find some clues to why she was disgraced. 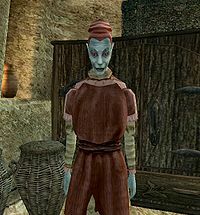 According to Eno Hlaalu, she was "much blown upon" as the Ashlanders call it, and he says he took advantage of her "favors" when he was young as well. Other male Dunmer have the following things to say about her; Elms Llervu: "I see her now and then, but we are not close like we used to be, before I realized what her game was." Nalis Gals: "I am glad my brother warned me about her before she could test her favors on me." Athyn Sarethi: "I already had a daughter her age when she was in the arms of more men than was proper." This page was last modified on 19 April 2016, at 01:47.